Hearing deficits can cause sensory impairment and a decrease in the quality of life. Although the mechanisms involved have yet to be elucidated, evidence suggests that a subset of connexins play a critical role in hearing. Remarkably, 1:2000 children will be born with congenital deafness, 50% of which will be due to GJB2 (Cx26) or GJB6 (Cx30) gene mutations. Consequently, it is now standard operating procedure in developed countries to genetically screen these children for GJB2 or GJB6 gene mutations. 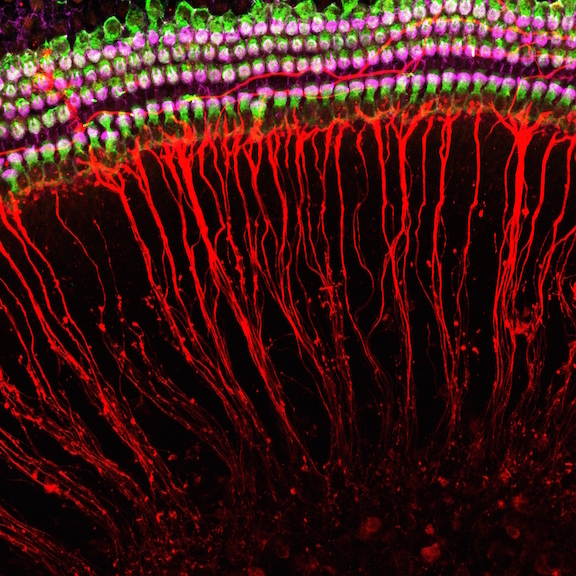 How connexin gene mutations cause hearing loss remains controversial as earlier studies supporting a role for connexins in recycling potassium through the epithelial and connective tissue network of the organ of Corti back to the endolymph has been challenged. Moreover, the role of auditory track connexins in noise-induced and age-related hearing loss remain poorly understood. Together with Dr. Brian Allman at the University of Western Ontario, we are investigating the scope of auditory track connexins involved in hearing and the underlying mechanisms. J.M. Abitbol, J.J. Kelly, K.J. Barr, B.L. Allman and D.W. Laird (2018) "Mice harbouring an oculodigitodental dysplasia-linked Cx43 G60S mutation have severe hearing loss" Journal of Cell Science 131:1-14 (selected for the cover). J.M. Abitbol, J.J. Kelly, K. Barr, A.L. Schormans, D.W. Laird and B.L Allman (2016) "Differential effects of pannexins on noise-induced hearing loss" Biochemical Journal 473: 4665-4680. A.C. Berger, J.J. Kelly, P. Lajoie, Q. Shao and D.W. Laird (2014) “Mutations in Cx30 that are linked to skin disease and non-syndromic hearing loss exhibit several distinct cellular pathologies” Journal of Cell Science 127:1751-1764. Recommended by Faculty of 1000, F1000Prime. S. Penuela, L. Harland, J. Simek and D.W. Laird (2014) “Pannexin channels and their links to human disease” Biochemical Journal 461:371-381.